I’m birding across North America in 2011 in what’s called a “Big Year”. You’re welcome to join me. Linda and I are leaving for Costa Rica Thursday evening, Nov. 21. We were invited to a destination wedding in Tamarindo, which is one of the main beach areas in the North Pacific that Americans and Europeans journey to for vacation. We’ll stay there for five nights than visit the Arenal area for four nights followed by two nights near Carara NP. After that Linda returns home and I “go deep” for four nights at the Costa Rican Amphibian Research Center on the Caribbean slope east of San Jose. Making me look like Carnac the Magnificent, last Saturday (Feb 18, 2012) Brian Patteson, the Admiral of the Atlantic, had a Black-browed Albatross only one mile out from Hatteras Inlet that stayed with his boat for forty-five minutes! It was an amazing pelagic trip indeed. They also had three or four different Great Skuas as well. An Iceland Gull, Dovekie,, and multiple Razorbills rounded out the rarities. This was dubbed as the “greatest winter pelagic trip ever” and who can argue. If I had been doing a Big Year this year, I would have been on this boat. Here are some photos of the trip from Scott Winton. On this date in 2011, I was at 347 species. You could assume that this years Big year birder would be around the same numbers but would have been about five or six rarities ahead of me…and that’s what counts. Great Skua – February or December? Wes Hatch asked if I would advise trying for Great Skua in February or wait till December like I did last year. I would strongly recommend going on one of Brian Patteson’s February trips. This is the traditional and your most likely opportunity to see a Great Skua. In fact you should plan on going on multiple trips during your visit to Cape Hatteras to maximize this opportunity. If I were to have attempted a full-blown ABA Big Year in 2012, I would be off to a strong start. My year would have begun in Anchorage and I’d remain there until I saw the Dusky Thrush. It was seen on Jan 1 and Jan 2 so by the third I’m flying south. I’d then travel east to tick the Chaffinch and would have added both a Barnacle Goose and a Pink-footed Goose…just to get them out of the way. In 2011, I should have made more of an effort to tick the Fieldfare on the Gaspe Peninsula, I wouldn’t take the chance of missing a Chaffinch. I would not have travelled to Newfoundland for the Yellow-legged Gull, which is being seen off and on at Quidi Vidi Lake. While in the East, I’d travel to Ohio and Tennessee for the Black-tailed Gull and the Hooded Crane, then headed to Texas for the Black-vented Oriole, which was regular till at least Jan 10. Crimson-collared Grosbeak, Golden-crowned Warbler, Brown Jay and Rose-throated Becard. I would have missed the Blue Bunting seen on ¼ & 1/5. Next, I would have traveled west to Arizona to get the Rufous-capped warbler. By the way there are Black-chinned Sparrows all over Florida Canyon right now. They’ll be gone by March. Black-capped Gnatcatchers and Rufous-backed Robins seem to be regular at multiple locations so I tick them while at it. Then on to the Nutting’s Flycatcher along the Colorado River and then the Falcated Teal where I also add Eurasian Widgeon to my year-list. I also add the Ruff at Crittenden Marsh (Stevens Creek Nature Study Area), Santa Clara, California After this I settle home in Colorado for a day or two, but Florida (Fork-tailed Flycatcher and American Flamingo and possibly La Sagra’s Flycatcher), Arizona (Streak-backed Oriole), and Nebraska for the Common Crane have me sitting pretty by Feb 10. There were some truly exciting birds in the ABA area this January that would have impressively launched someones Big Year. I’ve been keeping taps on these birds and noting whether they’re chasable or not. I’ll publish a hypothetical list in the next couple of days. Folks, I’ve been negligent in approving comments until just now. Sorry about that. I was slammed with a nasty cold that hit just before year end. Can’t complain though as it was my first cold or illness of 2011. Anyway thanks once again for all the great comments. The Big Year is finished. Soon I’ll slip back into relative anonymity. But while I still have your attention, I would like to reflect on this very special year. It’s been one huge wild, crazy ride. Day one provided a hint of how special this year would be when at 4:15 PM, a Black-headed Gull graced us with a defining look as it descended onto Carter Reservoir. Of course I’ve enjoyed the satisfaction of successfully planning and strategizing the year and Its been lots of fun to execute the plan, but that all pales in comparison with the adventures I’ve had and the people I’ve met along this year-long journey. So many images are now vividly etched in my mind.  Watching and listening in utter amazement as Davis and my two brothers stood outside the car on a lonely, snowy road in Northern Minnesota howling at the top of their lungs in an effort to call in wolves.  The sense of accomplishment I felt when after three hours of searching I re-found the Fork-tailed Flycatcher in Ft. Lauderdale and then called in local birders so they could also see this rarity.  The personal triumph I felt after the twelve-mile climb to the top of Boot Canyon then photographing the Colima Warbler.  The mixture of excitement and apprehension while driving the road to French Joe Canyon where no Subaru dares go -by myself, not a soul within miles and finding two Black-chinned Sparrows.  Having Linda by my side when the mystical John Drury pointed up to announce the arrival of the Red-billed Tropicbird at Seal Island in Maine. My senses came alive in 2011. Truthfully every new year-bird I saw brought excitement throughout the Big Year. When was the last time I’d been stoked by finding a Steller’s Jay? On Jan. 26th in Hurafano County, CO I clutched my fists in triumph and said to myself “Yes…got you.” The gnawing feeling in my stomach when I’d missed the Curlew Sandpiper by minutes, then the joy of a phone call from Barbara Carlson two hours later letting me know it had returned. There are 100’s of examples like this. I’ve met so many interesting people along the way, some, that will hopefully remain friends for a lifetime.  Meeting “the Musketeers “ on Brian Patteson’s boat, which culminated in the all night run to Cony Island. The visually intoxicating blend of New York City -Puerto Rican woman, shirtless old guys, Nathan’s Famous Hotdog Stand and the Gray-hooded Gull- will remain with me forever. Only in the Big Apple.  Laughing while listening to Todd McGrath recount his strategy for quieting poor Curtis Marantz on pelagic trips..
 I’ve enjoyed talking with and listening to the stories of the “Heavy Hitters”.  I’ve had the privilege of birding with some of the best in the world. How often does one have Guy McCaskie present his telescope for me to look at my life Curlew Sandpiper?  All four of my brothers participated in one adventure or another. 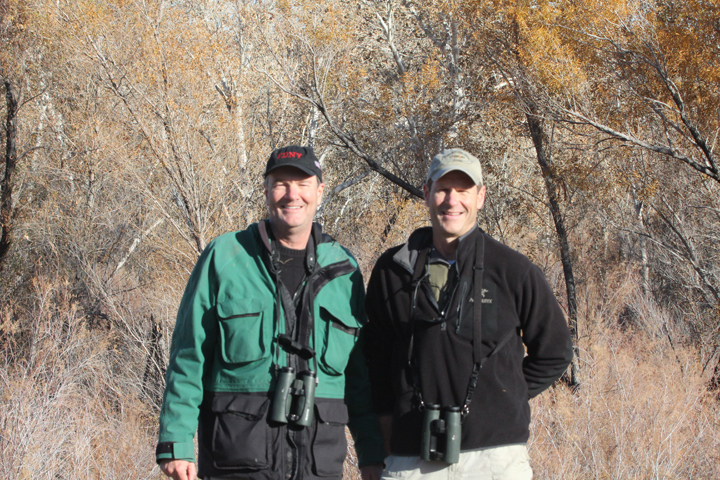 It was a treat to actually tick a Big-Year bird with both my Uncle Bob and my son Scott. The blog has been an unexpected bonus. I’m truly humbled by the relationship that developed with all of you blog readers. As the year progressed, I slowly came to realize that this was no longer just about me. It had metamorphosed into a group thing. You blog readers lifted my spirits when I was down and inspired me to fight through my disappointments and failures. I wish to say one last time thank you for tuning in.  First and most of all, thank you Linda for allowing me to live my dream for an entire year. I owe you for this one. Thanks to Scott for believing in me and keeping his mom calm!  Thanks to Bill Vanderpoel who was a companion on almost twenty of my trips. (Plus he found the Eurasian Bullfinch on St. Paul). Bill ended up with a year-list of 588 species himself.  Thanks to my brothers Tom, Jim and Mark for sharing some of my adventures with me.  Thanks to Jon Dunn for his wise consul (except in the matters of politics) and for keeping my list “squeaky clean”.  Thanks to Paul Lehman for sharing his knowledge of distribution and vagrancy patterns with me. It was of great value in the decisions I made.  Thanks to Mary Gustafson for continually updating me on Texas rarities, for showing me the Hook-billed Kite and suggesting the June strategy.  Thanks to Larry Manfredi for all the help in Florida. It was a pleasure birding with you and discussing strategies via the phone.  Thanks to Susan Billetdeaux of NARBA. You were always so helpful and quick to respond.  Thanks to Doug Goshfeld, Stuart Healy and Derrick Lovitch.  Thanks to Bill Kaempfer and Peter Gent for sharing their ideas with me along the way and for joinging me on trips. Thanks to Todd Deininger for the frequent updates on rarities.  Thanks to Doug Koch, Ken Petersen, Liz Southworth and Chris Hitt for joining me on multiple adventures and chase trips. It was a whole lot of fun.  Thanks to Don Desjardin for all his help in Southern California. Don we still need to try for that Giant Kangaroo Rat.  Thanks to John Puschock for the timely updates on rarities.  Thanks to Rick Dorazil, Gene Wilson. Tom Wilberding and all the rest of you that made a contribution to Citizens For Conservation on my behalf.  Thanks to Colleen and Stephen Hook of McAllen, TX for opening your home to me.  Thanks to Carolyn Ohl for opening her wildlife preserve for me in the Christmas Mountains.  Thanks to Susan Foster for arranging to take me into Lala Ranch.  Thanks to Judith and Whitekeys, Aleta Pillick and Isaac & Crystal Helmericks for your kind hospitality and helpfulness. Isaac congratulations on your first North American Record –Asian Rosy-Finch. Why couldn’t you have found the darn bird while I was there?  Thanks to the Canadian contingency – Dave Brown, Ann Nightingale, Rick Schortinghuis, David Currie, Leah den Besten & Ron Pittaway and Jean Iron . It was delightful to share all your company. Thanks to Ron Martin for the hospitality and birding support. I suppose it was meant to end this way. One last chase accompanied by my brother Bill. Bill was with me on the first chase of the year and now was along my side here in Arizona for the last chase. We arrived at Planet Ranch Road in the Bill Williams Delta just after 8:00 AM. 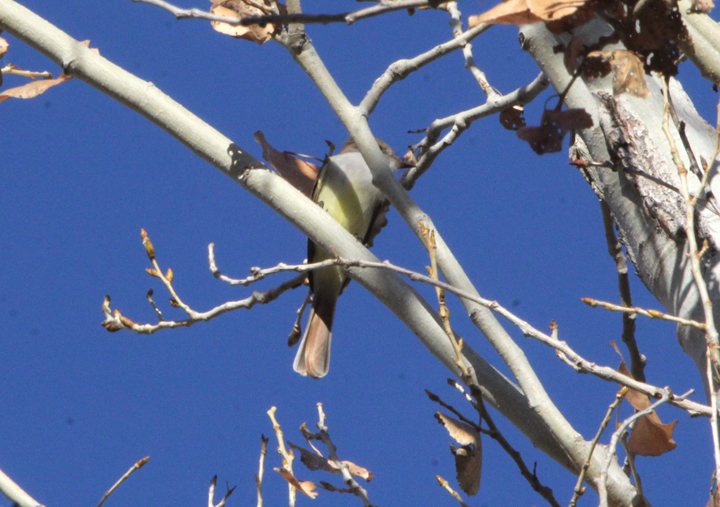 A birder from Ontario, John Lemay, was already on the scene We heard the Nutting’s Flycatcher as soon as we reached the three Sagurao cactus, but it took another hour to properly see and photograph it. And I certainly wanted a decent photo of my last year bird of 2011. Number 744 for the year. Coincidently my last bird of the year was Sandy Komito’s first bird of his 1998 Big Year. So this evening and tomorrow will be relaxation time. I do plan to post a “final” blog on Monday, Jan.2. Today was a long day which began in Norfolk, VA at 4:30 AM Eastern Time and ended at 11:55 AM Rocky Mountain time in Phoenix. In between I visited Whitby Harbor to try for the Smew. Jean Iron and Ron Pittaway picked me up at Toronto Pearson Airport and we drove straight to Whitby Harbor. But a cold front had come in Wednesday night and all the Red-breasted Mergansers and the Smew were gone. Tomorrow I end the Big Year with a try for the Nutting’s Flycatcher. Thanks Jean and Run for all the help.